With many tragic story lines of the 2018 season, there is one that seems to characterize everything erroneous with our beloved team from Flushing. 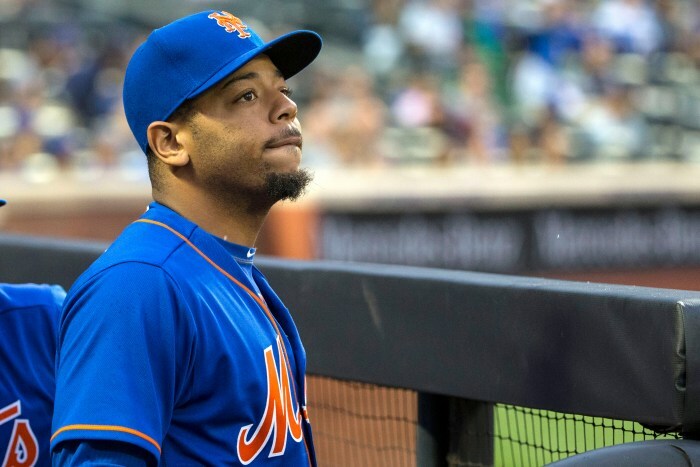 Dominic Smith has become a disaster that typifies the suffering of Mets fans. In 2013, the Mets took Smith with the eleventh overall pick. He was a hot shot prospect. That season ,the California native led his high school team to a division title. Smith was so feared that in the championship game he was twice walked intentionally. It was such a sure thing that Smith would be a top pick that he attended the draft ceremony in person. After being selected in the first round, the Mets gave Smith a $2.6 million bonus and his professional career began. At 18 years old, Smith was a highly regarded prospect. In his first season, Smith hit over .300 in rookie ball. He was promoted the following year. While his batting average was always good, the power only began to develop in 2016 when Smith was in AA. After slashing .330/.386/.519 is AAA, the 22-year-old was called up to the majors. It was here that the troubles started. When Smith arrived in Queens he was very heavy. For a guy who was only listed at 6 feet tall, weighing over 250 pounds is a lot. Smith wasn’t simply overweight, but obese. If he had been loaded with muscle, things would have been viewed differently. Sadly, that wasn’t the case. Many people were scratching their heads. How could a top draft pick and one of the best prospects in baseball simply let himself go like that? Was anyone in the Mets organization monitoring the health of their future star? Simply put the answer was no. In fact, the New York Times reported in March 2018 that no one was really monitoring their major league players to a significant degree. The clubhouse spread after games was junk. In the minors, the situation is notoriously worse. As a result, Smith’s weight ballooned. As a rookie, Smith was noticeably out of shape. Recently, a rather unfavorable article came out. While the source is obscure, the allegation is damning. The claim is that after less than two weeks in the majors the Mets coaches decided to dramatically alter his swing. Using launch angle analysis, it was decided that Smith would be a power hitter. While he dominated the minors as a line drive hitter, this needed to change. As a result, Smith’s offensive numbers plummeted. He slashed .198/.262/.395 as a Met as he was swinging for the fences. Smith did slug 9 home runs in just 167 at bats, but for the wrong reasons. In the end, Smith had a WAR of -1.2, which is horrible for such a short time span. Prior to the season, the Mets made it clear that youth was not the way of the future at first base. Despite, the fact that that winning teams have strong cores of players they developed in the minors, the Mets would have none of it. Smith had a bad rookie year and would pay the price. The Mets decided that the man for first would be Adrian Gonzalez. While A-Gon could have been a good guy to have on the bench, playing him every day was a classic example of building an all-star team from three years ago. By acquiring Bruce and Frazier as well, the Mets were building an old slow team. It took two months of subpar play of Gonzalez for the Mets to dump him. In the offseason, Smith did get back into shape. He lost around 30 pounds and looked much healthier. However, extreme weight changes do have consequences. Early in spring training, he strained his quad and didn’t get into a AAA game until mid-April. Smith got a chance to play for the 2018 Mets, but it doesn’t seem like a fair shot. The Mets already crowned Peter Alonso as first baseman of the future. Therefore, the Mets decided to change Smith’s position. About 40% of his defensive innings were in left. Needless to say, the experiment hasn’t exactly turned up a gold glover. The fact that in 2017 his defensive metrics at first were well below average didn’t help his cause. Probably the most iconic moment of Smith’s career thus far came when he didn’t bunt. In the month of horrors (aka June 2018), the Mets found the most creative ways to lose. One such game came on the 24th. With the game tied in the tenth, the leadoff batter reached on a walk. Smith was up next and the Dodgers over-shifted for an extreme pull. It was a situation that begged for a bunt towards third base. Doing so would have likely led to a single and a hard-hit bunt could have even turned into a double. Smith struck out and the Mets lost in the next inning. The fact that Smith doesn’t know how to bunt is just as absurd as Amed Rosario not being a base stealer. How does a player get through the minors without knowing how to put down a bunt? This is so basic. The same goes for Rosario, who only had four steals in the first three months while the team struggled to score. What is going on with the Mets player development? Where are the fundamentals? Two months later, this scout sounded prophetic. In spring training Smith got a lot of negative press coverage after he showed up late for his first game. From that point on it was clear that he wasn’t getting the starting job. After the injury, Smith was all but forgotten. As Rosario struggles, many wonder what is wrong with the Mets player development. It is hard to say if Smith has a future with the Mets. It seems that he will stay around for the time being as insurance on Alonso. However, a lot that can be learned here. For starters, player development is something that needs to be taken seriously. The point of the minor leagues is to develop players who are ready for the majors. Winning the games themselves is secondary. As an organization, the Mets need to take conditioning more seriously. While injuries are overall down from last year, there are still many problems as we saw with the handling of Yoenis Cespedes. The coaches and analysts need to learn that tinkering with a player’s swing could have disastrous consequences. Lastly the Mets need to realize that sometimes you have to just let a young guy play and learn to become a professional. Patience is a virtue. The Mets gave Smith less than two months before writing him off. Smith is still young, and his career could rebound. He needs to understand that being a top pick isn’t a guarantee for big league success. In fact, four of the players picked ahead of him are either out of the game or haven’t even played two major league games. From his draft round 10 of the top 22 players have less of a big league resume than Smith. Being a top pick just ensures a big bonus. After that, one must constantly work hard. Many guys with less talent hang around because they can play many positions. Being a top pick isn’t a golden ticket for success. It is hard to be confident that Smith will be a star of the future, but baseball is a very unpredictable game. Previous Update: Will the Mets trade Bautista to the Phillies? Right on target, David! you give voice to my frustrations and to those of many other Mets fans.